The March of Dimes is a nonprofit organization dedicated to improving the health of mothers and their babies. Since their founding in 1938, they have expanded not only their size, but their overall mission from specifically combating polio to improving the general health of all expectant mothers and babies. Today, they have chapters all across the country and host hundreds of March for Babies events aimed at raising awareness and funds in support of their mission. 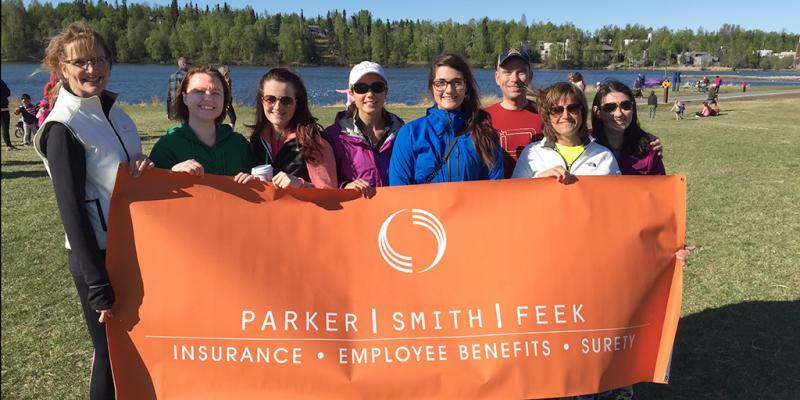 Their most recent event was held in Anchorage, Alaska, and Parker, Smith & Feek was a sponsor. Volunteers, sponsors, and participants all gathered at Westchester Lagoon last Saturday for the event. On what turned out to be an absolutely gorgeous day, participants gathered and took advantage of the stroller decorating contest, bouncy house, and other sponsored activities. A group of employees from Parker, Smith & Feek’s Anchorage office joined in the fun to support the improved health of all expecting mothers and their babies. Thanks for supporting such a great cause!